Throughout this series of articles, I’ve ignored the situation in which the user made an error when entering data into a checkbook record. Once entered, there was no way to make corrections to an individual record. I’ll remedy that shortcoming now. The editing process will be initiated by the user double-clicking on a particular record. That record will be formatted into a string in the same way it would be when saving to a file, and the string is sent to the edit window along with the line number (as a pointer) in TransWindow’s transList. Rather than introduce a new edit window, I’ll use the existing CheckWindow or DepositWindow that have been a part of the application from the beginning. Throughout this description I will use the example of a check transaction, but both a check edit and a deposit edit will be incorporated into the application. I’ll also add two boolean properties, DRedit and isCleared, to the G lobalFinancial module. If you have read most of this series of articles, you should now be able to understand the code in this method. 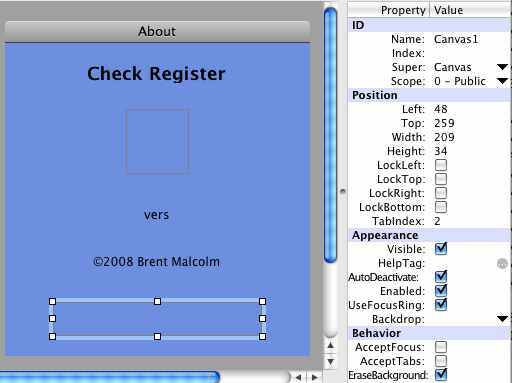 After initialization, the record line is parsed and the fields in CheckWindow are populated. me.Title = "Write Check "
if isEdit Then me.Caption = "Cancel"
First, some flags are set and then the type of record is determined. Then CheckWindow or DepositWindow editInit is called as appropriate. The line that’s commented, “De-select the row,” simply removes the blue highlight that automatically appears when the user clicks a listbox row. 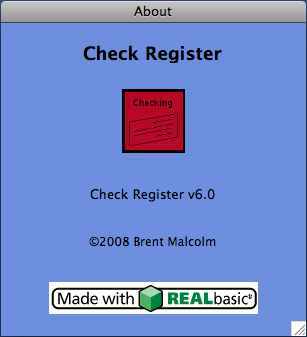 Now, when the user double-clicks a transaction in the check register , CheckWindow appears with the check data as shown in Figure 1. 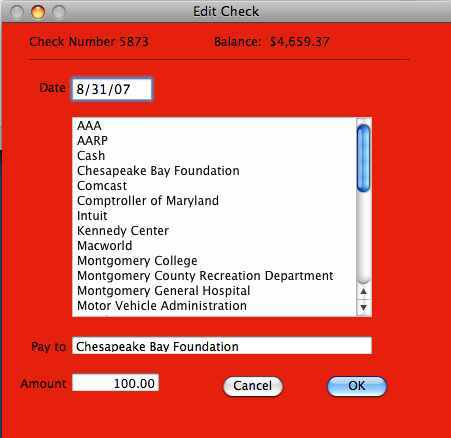 Figure 1 - The Check Window transformed into a Check Edit window. In both of these methods, the “void” case is handled and then a record string is constructed and handed off to transWindow’s addTransRow method to insert the data. This completes the addition of an edit function. As I mentioned earlier, the same modifications are done to DepositWindow to provide the edit function for deposit records. What Happens with a New Name? In the last article, I covered the editing capabilities for the Payee and Depositor files. But what if you wanted to simply use a new name when writing a check or making a deposit, without going to the trouble of first modifying the appropriate list of names? If you use a new name, the application should be smart enough to recognize it as a new name and query whether you want to add it to the associated list. Here’s how I’ll add that capability. If you look closely at the editInit method at the beginning of this article, you’ll notice that when the incoming line is parsed, the variable tempName is set to the Name (Payee), and then the edit field pay.text is set to tempName. If the user, while writing a new check or editing an old one, enters a new name into pay.text, it will differ from tempName and a simple test can trigger a query whether or not to add the new name. If Pay.text <> tempName then queryNewName //new name to be added? This method initializes the new variables and calls the new dialog box. 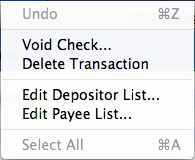 If the dialog box returns True the new name is added to the list of Payee names and the list is flagged to be saved. Figure 3 shows the new dialog box, AddName. Figure 3 – Should this name be added to the list? This window’s Open event handler must set the correct window title depending on whether the name the user enters is a Payee or a Depositor name. 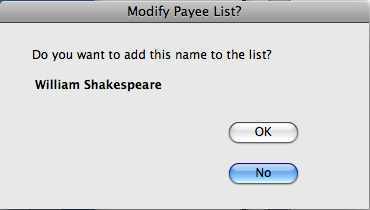 self.Title = "Modify Payee List?" self.Title = "Modify Depositor List"
This code steps through the application’s open windows. If the open window is named “Write Check,” the call must have come from that window so the title should be, “Modify Payee List.” O therwise, the call came from the Deposit window, so the title will be "Modify Depositor List." As before, similar code is added to the DepositWindow to test for a new name. The About box itself is a new window that will be constructed with a couple of graphic icons. I’ve placed the two graphic files in the same folder as the application. Figure 4 shows the construction of the About box within a portion of the development environment before the addition of the icons. Within this box I’ve added two canvas controls. If you look at the right side of Figure 4, you’ll see a Backdrop property with a small disclosure triangle. Clicking on that triangle opens a browse menu that allows me to select the icon I want for each canvas control. The finished About box is shown in Figure 5. This concludes this article on REALbasic. In my next article, I will show you how to add an automatic deposit function to your program .